Koentact’s main objective is to spread the Dutch language the fun way among as many expats as possible. Being able to speak the local language is crucial if you have longer-term plans here in Holland: you can immerse in the culture of the country more deeply, leave communicational burdens behind, and have the chance to get more social and professional opportunities. However, it is not only adults for whom it is necessary to be able to speak Dutch. There are quite many families with non-native backgrounds whose children were born here but the spoken language at home is still of their former homeland. These children might find it a bit more challenging to live up to the daily expectations of the Dutch educational institutions than native speakers of Dutch. To give a little boost to these children, Koentact gives extra-curricular Dutch lessons in Slotermeer, Nieuw-West. The mission is to teach children (ages 8 – 12) Dutch in an enjoyable way so that they can improve their language skills and thereby succeed in their daily studies/life more easily. Not unlike the mission of Koentact with Expats 😉 In a vision of ‘language-for-language’ the Amsterdam Language Café is used to raise the funds for the Kinderproject. The project has been running for more than two years now and the children can not only practice stuff they learn at their elementary school, but they also learn new material, how to give presentations and to work in pairs or smaller groups. In addition, every lesson is spiced up with fun games such as Bingo or Hangman, songs, a little classroom gymnastics, or small DIY workshops such as Teddy bear sewing. The project has been growing: there are now two Dutch groups of fourteen children and there is also an English group of twelve children that started in September 2017. 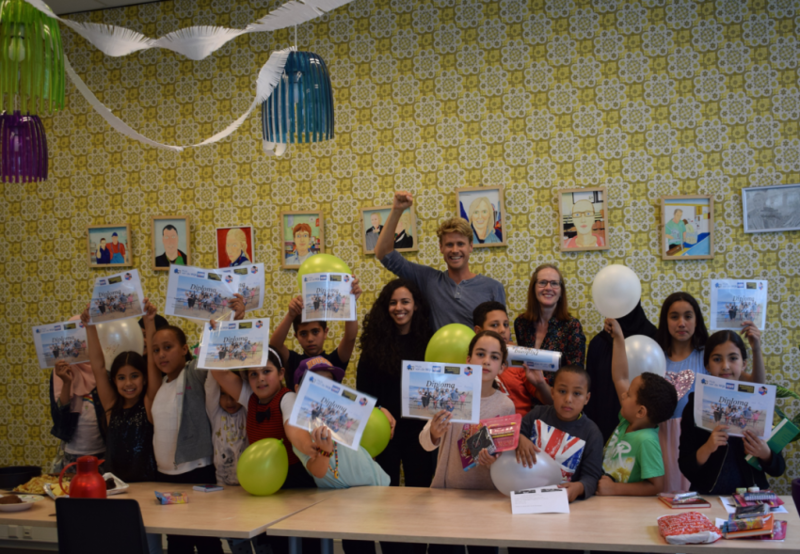 In 2016 the Kinderproject got nominated by Young Nieuw West for an award recognizing social involvement in the community. There are two teachers and three moderators for each group who plan the structure of the lessons carefully and guide the children through the various activities and tasks with patience and attention.